15th (Vancouver) Coast Brigade, R.C.A., N.P.A.M. 39th (Reserve) Field Regiment, R.C.A. H/Capt. F.A. Ramsey ) Attached. Notification was received that henceforward the expression, “N.P.A.M.” would be discontinued, and the army would be divided into the “Active” and “Reserve” forces. On 19 Jan. 41, the N.C.O.’s qualification course for the rank of Sergeant took place at Bessborough Armouries, the examining board being composed of Officers of the 15th Vancouver Coast Brigade, C.A.S.F. The President was Captain E.A. Royce, and the members, Lt. T.M. Hunter and Lt. K.S. Auer. On 20 Jan. 41, 2Lt. W.J.C Kirby and Sgt. E.A. Wood went to Canadian Small Arms Training Centre, Lethbridge, the former on a P.T. course, and the latter on a chemical warfare course. Officers - 25 (2 attached). (Exhibit 14 – Part One Orders – Numbers 1 to 4. Exhibit 15 – Part Two Orders – Numbers 1 to 5). K 415510 – Bdr. GRANT, D.B. was appointed 2/Lt, effective 2 Jan. 41, and posted to 31st Battery. K 417502 – Sgt. KEELING, F.T. was granted Commission in the rank of Lieutenant (P.M.) and posted to Brigade Headquarters effective 11 Jan. 41. Lieutenant (P.M.) W.S. Day was transferred to the Reserve of Officers effective 10 Jan. 41. On 16 Feb. 41, a qualifying examination for D.R.F. specialists was held at Point Grey Fort. A second Regimental N.C.O.’s course was commenced with special instruction every Tuesday and Friday evenings. On 27 Feb. 41, Capt. R.P. Wood, R.A., gave a talk to all ranks on “A.A. Defence in the British Isles.” He dealt with the history of Anti-aircraft Units in England since their period of training before the war right up to the present time, and delivered an extremely interesting lecture. 2/Lt. W.J.C. Kirby and Sgt. E.A. Wood returned from courses at Lethbridge, both having obtained “Q-1” qualification. (Exhibit 16 – Part One Orders – Numbers 5 to 10. Exhibit 17 – Part Two Orders – Numbers 6 to 10). On 2 Mar 41, a Brigade parade was held and the Unit moved to the Indian Reservation to the west of the Point Grey Golf Club, and constructed gun emplacements on the dyke by the Fraser River. Each Battery had its own position and remained out all day. Aerial photographs were taken of the position and are appended as Exhibit 19. Special operation order is appended as Exhibit 18. On 23 Mar 41, the Unit attended the Service at Brockton Point in connection with the Special Day of Prayer. This Service was attended by Units both Active and Reserve from the city. Special order covering same is attached as Exhibit 20. Capt. F.A. Ramsey ceased to be attached to the Brigade on being attached to the 15th Coast Brigade R.C.A. A.F. effective 4 Mar 41. 2/Lt D.B. Grant was appointed effective 17 Feb 41. Major T. Todrick was called out under G.O.139 and attached to R.C.A. Training Centre, Winnipeg, for all purposes, effective 21 Mar 41. 2/Lt.’s A.L. Brady and C.C. Locke were appointed to the 15th Coast Brigade R.C.A A.F. both on 24 Feb 41. Officers - 23 (1 attached). (Exhibit 18 – Special Order for 2 Mar 41. Exhibit 20 – Part One Orders – Numbers 11 to 13 + Special Order. Exhibit 21 – Part Two Orders – Number 11 – 18. Exhibit 22 – Photographs of Parade 23 Mar 41. On 28 Apr 41, the Regiment was inspected by Major General Griesbach, Inspector General of Western Canada. Special Order is attached as Exhibit. 2/Lt Graham Frederick Blythe and 2/Lt John Alexander Macauley were appointed to the Regiment effective 8 Mar 41. Lieut. W.S. Day resigned his Commission effective 10 Jan 41 and was replaced as Paymaster by Lieut. Fred­­­­­erick Temple Keeling. Capt. 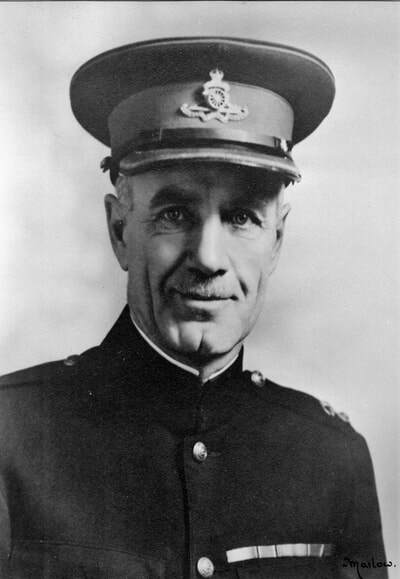 Morgan was placed on command of Number 11 Detachment R.C.O.C. and ceased to be Quartermaster. He was replaced by 2/Lt Walter Francis Pringle. The future Capt. J.A. Hobday enlisted as a Gunner 2 Apr 41. During the month 21 members of the Regiment qualified as Sergeants and 17 as D.R.F. Range Takers. (Exhibit 23 – Part One Orders 14 to 17). (Exhibit 24 – Part Two Orders 19 to 23). (Exhibit 25 – Special Orders dated 28 Apr 41). Major T. Todrick was detailed to proceed to Winnipeg to take over a training centre there on May 16th and Capt. Morgan on receipt of an appointment in the R.C.O.C. in Victoria finally left the Brigade. Capt. A.M. McGavin was posted to the 31st Battery to take command in place of Major Wallace who was appointed Second in Command of the Brigade in place of Major Todrick. On May 20th the 31st Battery had a dinner at the Armories. On June 14th 2/Lt. W.F. Pringle received his Commission and was appointed Quartermaster in place of Captain Morgan. Captain C.R. Burton, M.C. started on a course at Camp Borden on June 14th. On Sunday June 29th the Unit accompanied by Detachments from the First Searchlight Regiment R.C.A. (Reserve) and the Fifteenth (Vancouver) Coast Brigade R.C.A. attended a Church Parade at St. Mark’s Church in connection with the National Dedication Sunday. (Exhibit 30 – Special Orders dated 27 June ’41). On 5th July, practical examinations were held at Point Grey Fort when qualifications as Lieutenants was obtained by 2/Lieutenants H.D. Arnold and D.B. Grant. Cadet H.F. Jones of C.O.T.C. was also successful. 2/Lt. G.E. Lennox was appointed to the Brigade effective 1st July. On 20th July, the Brigade went to annual camp at Mary Hill. The journey was made on the regular Victoria boat, and the Brigade was met by a convoy of trucks at Victoria, and was driven out to the camp which was situated quite close to the seashore on the opposite side of the bay from the William Head Immigration Inspection Station. The camp was attended by 10 officers and 133 other ranks. The camp site was very nicely laid out on the side of a hill and the immediate area contained one small field for training purposes and one very large one. Neither of these was very flat, but they were quite satisfactory. The training consisted almost entirely of basic subjects and there were eight qualified Instructors present throughout the camp so that the Brigade got a very thorough workout sofar as the men were concerned, but the Officers and the Senior N.C.O.’s got comparatively little training in their functions. Quite a good sports programme was arranged and soft ball and volley ball were the principal games. The Brigade was able to raise quite a good soft ball team which played with fair success against other units in the area. On the Sunday in camp quite a number of games were played including one between Officers and Sergeants. On 31st July, the General Officers Commanding-in-Chief, Pacific Command, inspected the Brigade. After a formal inspection and march past, the programme consisted of a continuation of the normal syllabus, while the Inspecting Officer visited each group in turn. (Exhibit - Part One Orders – Numbers 27 to 34. Exhibit - Part Two Orders – Numbers 33 to 37.